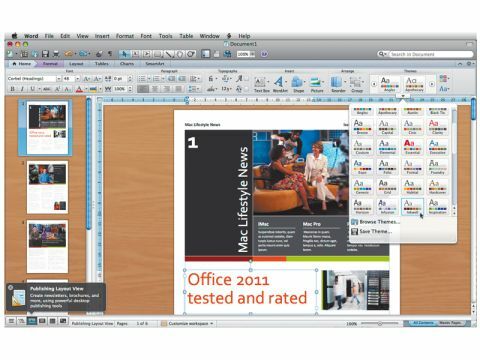 Make no mistake, Office for Mac 2011 is a big improvement over the previous iterations. Across the board, it's noticably faster and feels more at home on the Mac than before. Microsoft has also added some thoughtful features throughout. We love the full-screen mode in Word – it's distraction-free writing at its best. Similarly, the return of Visual Basic for Applications will be reason enough for some to take the plunge and upgrade. The item reordering in PowerPoint is another nice touch, even though we'd like to be able to edit items and see a live preview as you edit. The Web Apps are a welcome addition too, as is the ability to collaborate in real time online. The contextual Ribbon toolbar takes its bow on the Mac. As we noted in our Excel review, you can disable it if you're not a fan, although this does hide away many options. You get a regular toolbar above the Ribbon, which you can customise in the different apps. Doing so in Outlook was a Mac-like case of drag and drop, whereas in Word, there was a more complex dialog. Ultimately, though, you can't get by on the old-style toolbars alone – the range of options just isn't there. There are still some annoying little characteristics that will grate over time – such as when you click Cancel to get rid of the Document Gallery, it still opens a fresh document in that app. But don't let these things put you off, because this is a vast improvement over what came before at a more competitive price. There are two flavours of Office 2011, one with Outlook and the other without. Microsoft has dropped the prices of both compared to Office 2008, so you now get the Home & Student for £90 (only £10 more than iWork '09). To get Outlook will set you back an additional £100, effectively pricing the mail and calendar client at more than Word, Excel and PowerPoint combined. For home users, there's absolutely no need to spend the extra though – so go for the Home & Student edition. Similarly, if you run a small business and are keen to keep costs down, you can use the applications that come with your Mac anyway, such as Mail and iCal. If you run Exchange servers, these apps will talk to them, and they enable you to manage centralised or shared calendars, so you'll be able to get by without spending the extra. Where Outlook will be of interest is for power users who need to manage their own and other people's mail, contacts and calendars via an Exchange server. Yes, you can do this with Mail et al. But using Outlook will make your life a lot easier.